Hard water is beneficial to koi, as it contains trace minerals, salts, and replenishes a ponds pH buffer (KH). Water hardness, or “general hardness”, refers to the mineral content in water, which includes calcium, magnesium, borate, silica, and iron. These metal ions are a result of carbonic acid within rain dissolving mineral-rich rock, such as limestone, as it runs naturally through layers of sediment, rivers, and streams. Along the way the water picks up dissolved minerals, and the more minerals it picks up, the harder the water is considered. In areas with little limestone or dolomite formation, water is usually considered soft, as it contains much less dissolved mineral content. Within both the aquarium and pond hobbies, general hardness is used to determine the total dissolved mineral concentration in water to ensure it’s safe (or optimal) for fish keeping. Depending on where you live, your water will have varying degrees of hardness, and may contain a different concentration of the various metal ions that contribute to its overall hardness. Calcium (Ca++) usually makes up 2/3 of a waters total hardness parameters, with the remaining 1/3 being magnesium (Mg++) and trace amounts of other metal ions – this is also why it’s sometimes called “calcium hardness”. Water hardness parameters are often measured in ppm (parts per million) or milligrams per liter (mg/L), and can be thought of simply as the total amount of metal ions dissolved within an aqueous solution. Note: The different terms for water hardness are commonly confused with “carbonate hardness”, which actually has nothing to do with water hardness and is a different topic altogether. Alongside general hardness, you also have other closely linked water quality parameters known as alkalinity and KH (carbonate hardness). This is where confusion can arise, as not only do you measure these in similar ways, but the definitions sometimes overlap depending the source of literature. To make things simple, we only touch upon alkalinity in this article and use the term KH (carbonate hardness) as it’s more common within the koi hobby. 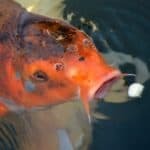 Hard Water Vs Soft Water – What’s Better for Koi Carp? A long debated topic within the koi keeping hobby, and one that is still actively discussed within the modern trade. Depending on hobbyist you ask, some will claim that soft water is better for koi, and others will stand by hard water..
Soft water can be detrimental to carp if it’s devoid of minerals and salts, as this can lead to problems with basic bodily processes. Looking deeper into the science behind water hardness in aquatic culture, all things seem point to a single conclusion: harder water is better for koi, so long as the hardness comes from calcium and magnesium – but why is this the case? A major concern with very soft water is the potential lack of dissolved salts, such as calcium and magnesium, which are important for the regulation of electrolyte (salt) levels within blood of fish through a process called Osmoregulation. Calcium and magnesium ions, found in higher concentrations in harder water, are essential to many important biological processes of fish, such as the ability to create new bone tissue, scales, blood-clots, and metabolic reactions. Fish, including koi carp, will actively absorb both calcium and magnesium from the surrounding water or from their food source, with dissolved calcium being particularly important for the regulation of salt levels within the blood. Having a higher presence of free-ionic calcium within a koi pond helps reduce the loss of other important salts, such as sodium and potassium, during the excretion of bodily fluids. Both sodium and potassium are vitally important in koi and work to maintain healthy heart, nerve, and muscle tissue (1). Calcium works to not only prevent the loss of these salts from the blood, but is also required for the re-absorption of new salts that are lost throughout the day (2). Without calcium, such as in extremely soft water, koi will need to use much higher amounts of energy to replenish lost salts within the blood, which can lead to less growth, weak bones, and frequent illness. Calcium comes from dissolved limestone & dolomite, and is able to help lock down heavy metal toxins, such as lead and copper. As well as this, harder water helps lock down toxins extremely well, including metals such as zinc, lead and copper, which can easily dissolve in soft water and become dangerous. Carbonates and bicarbonates are also essential to the biological processes of many micro-organisms and bacteria, including the beneficial bacteria in your filter box. They will consume a large volume of carbonate compounds from the water on a daily basis, and this is one of the reasons regular water changes are important in koi keeping – the replenishment of trace minerals and alkalinity (i.e., carbonates). As a final note, and although water hardness does not always equate to higher alkalinity, if the hardness is due to calcium and magnesium ions, your pond will have higher buffering capacity against dangerous changes in pH – also known as its KH value. The higher the KH, the more stable your pond pH will be against possible swings in pH and crashes. How to Test Water Hardness in Koi Ponds – What are Ideal GH Values? Liquid test kits are more accurate than strips, and can provide values for both GH and KH. You can test general hardness with many commercial testing kits, such as API Ponds GH Testers, but this is also where things can become confusing in terms of definitions. General hardness, in most pond applications, will refer to the total concentration of dissolved calcium++, magnesium++, and other trace metal ions in water, with the results are often presented as mg/L (ppm) calcium carbonate [CaCO3]. Results are displayed in this way as CaCO3 has a molecular weight of 100, which makes it easier to equate values in comparison with other molecules. It should be noted that KH measurements in areas of high limestone hardness will often be identical to the GH measurement, as both are presented as total mg/L [CaCO3]. This can be confusing at first and may give the impression that the separate tests are incorrect, but it’s actually normal in most cases. This is because the “calcium” makes up the hardness, and the “carbonate” makes up the KH (alkalinity), and although their individual weights within the molecule are different, together they’re still measured as just calcium carbonate [CaCO3] – hence the same result. Taking this into account, and avoiding the inner details of alkalinity (a topic for another time), an “ideal” KH range would be very similar to an “ideal” GH range, as both are formed primarily of calcium carbonate. If you’d like to get an accurate measurement for just calcium by weight, not including magnesium and other potential metals, we recommend a test kit designed for calcium hardness, rather than general hardness, such as Taylor Technologies Calcium Kit. Although it is difficult to determine ideal parameters for koi, a commonly accepted range within the aqua culture industry is a free calcium++ concentration of 25-100 mg/L (ppm), which equates to an approximate GH hardness of 65-250 mg/L (ppm) CaCO3. Taking this further, many fresh water fish, including wild carp, have a calcium blood concentration of around 100 mg/L (ppm) (3), so for optimal osmoregulation and bodily function, a hardness as high as 250 mg/L CaCO3 could still be considered within the ideal range. Where hardness is due to limestone, the CaCO3 hardness results often reflect a mix of both free calcium and magnesium, with trace amounts of other ions. What do i use to raise gh in a 50,000 litre pond ? If I recall correctly, this product contains slow-release calcium chloride, so it should work very well for raising both water alkalinity (KH) and calcium hardness (GH). The dosing is 100g per 1000 litres of pond water, which should raise general hardness by approximately 50-90 mg/L (ppm).